VR – Virtual Reality seems to be the future for Facebook and they are doing something which we have only seen in movies like The Matrix before – building a whole new, digital world. For this, they have Oculus by their side, a company owned by Facebook (they made a 2 billion dollar acquisition last year ). Messenger Platform – Facebook released the Messenger Platform where developers can create apps specifically for Messenger. What this means is that developers can build apps that integrate with Messenger, where more than 600 million users can express themselves with new features. They have released Messenger for Business, an opportunity for communication with customers in real-time. Drones – Facebook is expanding all over the planet and they want to bring internet access to everyone, so, for this, they have designed their own drone under the name “Aquila” (meaning eagle in latin), having the wingspan of a Boeing 737. Videos – in an attempt to challenge YouTube’s position and usability, Facebook have added an embedding feature for videos uploaded through their social media platform. Facebook also released video API’s allowing more control and customization of videos uploaded through Facebook. 360 degree video experience – spherical videos on News Feed that allows users to choose the viewing angle almost like in virtual reality. Share and Send buttons you can now integrate into your mobile website. This is the short answer you wanted to know when you clicked on the headline of this post. This is the new stuff Facebook released for businesses. Until now, Facebook was used almost imperatively by businesses in their internet marketing strategy. And that is because Facebook is providing a platform with millions of users, all eager to stay in touch with their favorite brands. It also provides an advertising opportunity not just for big companies, but for small and medium businesses as well. 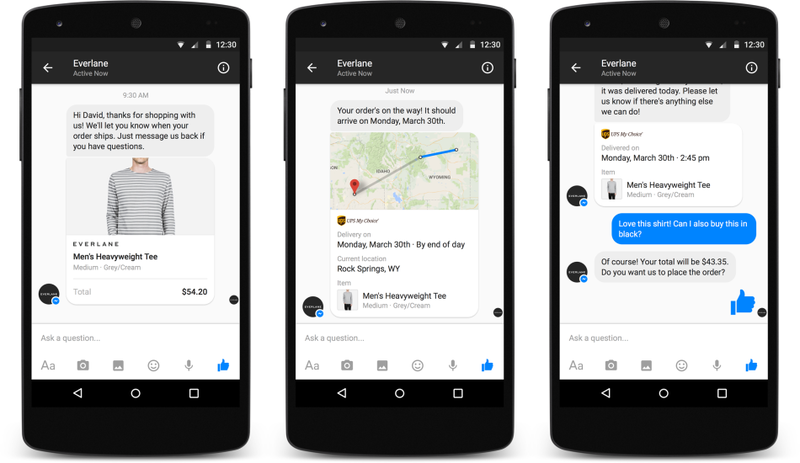 And now, they have launched Facebook Messenger for Business. But is it useful? The answer to the question is not so clear: it might be. It might be first of all if you have an e-commerce business: it can easily replace emails, providing a faster communication with real-time business to customer interaction. It is something more personal and maybe more helpful than emailing and traditional customer service. Plus, the platform allows companies to send push notifications which are timely and/or relevant. But for now, not anyone can use it: they partnered with Zulily and Everlane integrating this new messenger on their websites. Zendesk, the customer service software provider, is their “partner in crime” providing some quality customer service (hence they are one of the best in this matter). Still, you can sign up your online business if you are interested in this service and you might be able to test it and even use it. It is clear that Facebook is looking to provide a great experience, so they are carefully selecting the companies which can try out the new features of Messenger. you can use custom layouts for your messages. Your customers can keep all their order information in one place and can contact you via Messenger anytime they need to change anything. provide customer support in a more easy way. send push notifications to mobile devices with timely, relevant content. So, you have the possibility to provide a better user interface to your visitors, to engage with your customer in a more personal way and why not, sell more. But how well it will work, we’ll see it in time. I mean it’s not really an entirely new thing you know. Take Zopim Chat for example. Of course, it’s not connected with Facebook, you cannot use custom layouts, but it can serve the main purpose: to interact directly with the potential customer. Plus there are some doubts of how well it will work because in the past Facebook has released some other products which failed to perform in time like Facebook Home, Facebook Offers (coupon service), Facebook Questions (a polling featured which was discontinued), Facebook Places, Facebook Sponsored Stories and the list could go on. And to conclude, our opinion is that Messenger for Business is certainly a valuable asset which refreshes the experience of shopping online. It is a more personal approach, you can absolve your customers from going through the checkout process and keep in touch with them. On the other side, you need more personal to be able to chat and eventually sell to your clients. Don’t use chat bots, only if you have no other solution. That would be all for know. Tell us what you think about this new feature in the comments below. We’ll keep in touch. I’mOK, so are YOU. https://imok.biz/wp-content/uploads/2015/03/What-are-the-new-useful-stuff-Facebook-can-provide-to-your-business-1.png 315 560 I'm OK https://imok.biz/wp-content/uploads/2017/05/imOK-logo-2015-feher-184x300.png I'm OK2015-04-01 10:14:312018-01-25 21:14:29What is the new, useful stuff Facebook can provide to your business?